I'm so excited to announce that on this Saturday we have the return of the Atlanta Makeup Meet-up! We have a brand new location, tons of giveaways and education for you and it's all free. I'm so proud to be a co-host and founder of this group. If you're near Atlanta, you've got to check it out! So the reason we started this meet-up is because Atlanta needed a beauty community. Unlike NY and Cali, it's a little more separated and we don't have as many events and trade shows. However, we are moving on up! This event is completely free, and I'm not being paid to do it. I'm doing it because I love this industry and I want to give back. I totally urge you to join the group to take advantage of this great opportunity to learn and meet amazing new people. Each time, we cover a different topic requested by the group. This time, it's on color correction! That's a very popular request because people want a flawless face. Best yet, we have tons of giveaways! Including Graftobian Corrector Palettes and Sedona Lace Brush Sets! I'm really lucky that my co-host is Carla, the new manager at Binders Art Supply store. 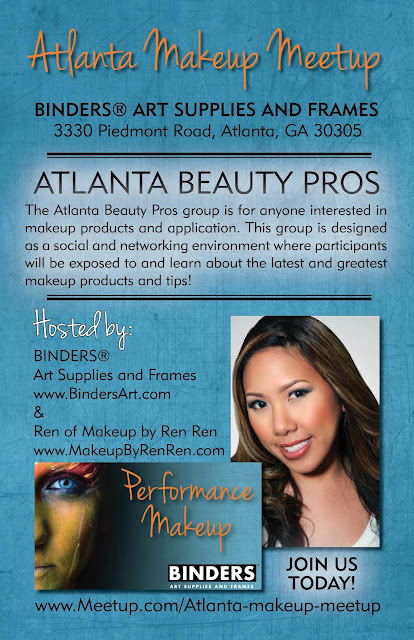 They've created a brand new makeup department and it's a great location to host the meet-up. This time around, we'll have balloons, food and prizes to launch the new meet-up location! Don't forget to bring your business cards to network and also to sign up for the professional discount for 20% off! Binders has also invited a speaker after the meet-up. Toni Martin is a beauty veteran and part of the International Association of Beauty Brands presenting "You Are a Brand" to show you how to market yourself in the beauty industry. 2:15pm-3:00pm Q&A and Chatting/Shopping - There is a great selection of pro products available in the store that we'll be using during the demo. 3pm Guest Speaker Toni Martin - Those who want can stay for the speaker after the meet-up. I know I will! That's where you'll be notified of new meet-ups and updates. I always get tons of questions about the group and dates, and if you register here (it's free by the way, no obligations, I moderate the group) you'll get email updates which makes it much easier to stay up on it. Also, we're starting to do field trips and other awesome things on there.